Just the sort of crunch you hope you are going to get when you buy a bag of Kettle Cooked Chips. The seasoning actually made them hearty as well as crisp and firm. As you will almost always find with Kettle Cooked Chips, there were curly and odd shaped Chips in the bag. There were also oil bubbles of various heights. What you rarely find however, is a bag of Chips which simmers and broods like a movie bad guy; skin burned and scraggy. The color was orange to dark reddish brown with scary black dots. Never have we seen Chips ooze irrepressible heat. The little heatometer on the bag is right up to the top and has "WTF" written underneath. Presumably that means, 'Welcome to Fun!' 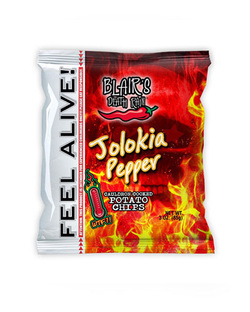 The first game is to find out what a Jolokia Pepper is. Well, the Bhut Jolokia, otherwise known as the Ghost Pepper, was the world's hottest pepper, only recently superseded by the Trinidad Moruga Scorpion. Oh dear. The heat actually increased as the Chips eating process continued. And it did continue because despite the spicy scorched barbecue (possibly - the heat had taken over by then) burn, mixed with a pepper we would not be rushing out to try, these Chips had a good flavor. Having said all that, Blair's are marketing this Chip as a challenge. The Chip won.